Yes, you are right, unlike in your comment there is no insult here. So you suggest sharing accounts for rights management? ...interesting. This does not demand anything like this, any more than having one proper pclaim does, though offers all the micro management and fine tuning one could ask for. Yea, unless someone uses 10k or more for whatever reason, going well beyond what most towns are capable to ED by their auth. So you mange important permission over "white"?! ...maybe you should go and explore town management for a good while before making suggestions here. AND it does not obstruct a "fancy solution in 2 years" even though you say otherwise. Taipion wrote: So you suggest sharing accounts for rights management? ...interesting. How would you allow multiple people to manage rights on a pclaim without allowing them to access that particular account? That is the BAD part in your pclaim idea in case you missed the point. Taipion wrote: So you mange important permission over "white"?! ...maybe you should go and explore town management for a good while before making suggestions here. Yeah, turning words around, right in the spot, too bad you attribute it to me not to yourself. Search forum for "white permissions" and see how much forum drama it generated. And no, towns do not have management by colours so far, LOL. Taipion wrote: Yea, unless someone uses 10k or more for whatever reason, going well beyond what most towns are capable to ED by their auth. That's a non-issue and can be solved. Determined people can grind a lot of cotton. Though that means a problem in recruitment process. Also, pclaims have shape limitations. To cover roads you would need long, narrow pclaims which are now forbidden for a reason. Relaxing that restriction in towns would allow funny exploits, like 1000 tiles long pclaims just to mess with people. You did not sound like proposing a temporary solution, besides, temporary solutions tend to stick forever and even when change comes we will have a chorus of people complaining how it would damage their gameplay and investments in pclaims. I'd rather wait a bit more and have it solved properly, than having a problematic makeshift solution. No, this is NOT a bad part in my idea, but a general limitation to pclaims, but is manageable as long as your mayor/leader/pclaim-manager is not afk or away for days. The way how account sharing is handled (rules), makes it an ultimate liability to everyone involved, and should be avoided at all cost, always. You should really know that. Chrumps wrote: Search forum for "white permissions" and see how much forum drama it generated. There you say it yourself, but attack me for saying it is a bad thing?!? ...are you even reading what you write yourself?! Also you are now throwing wild imaginations to what pclaims are "allowed" and what not at me?! ...you can do whatever pclaims you want on your own town area. Chrumps wrote: You did not sound like proposing a temporary solution, besides, temporary solutions tend to stick forever and even when change comes we will have a chorus of people complaining how it would damage their gameplay and investments in pclaims. I'd rather wait a bit more and have it solved properly, than having a problematic makeshift solution. Assumptions assumption, and as every single assumption you made here, it is both only fitting your own needs and also totally wrong. I have much, much better things to do than fighting a wannabe darwat forum warrior who does that for no other reason than "winning" or "triggering people" or whatever it is that drives you to do such lowly deeds. Man... you get triggered too easily. I am trying to tell you that using pclaims for detailed tclaim management is a bad idea because of multiple reasons. I respect the knowledge-base that the vet players of this game have, and I lean on it almost everyday that I play this game. 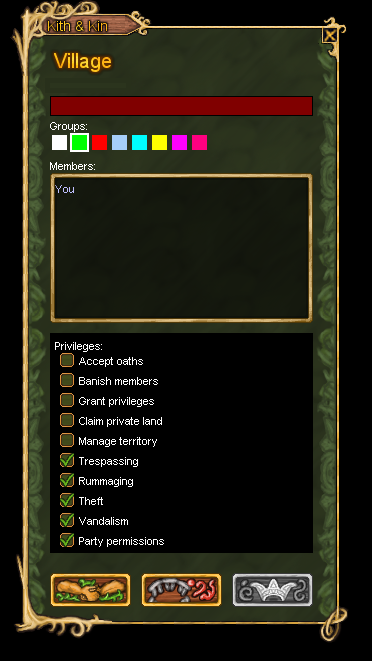 My short experience so far with TownBells leaves me wanting the same individual permission options (including color-coding) that Pclaims currently offer added to TownBells, and still allow Pclaims inside of Tclaims. Ronch wrote: I respect the knowledge-base that the vet players of this game have, and I lean on it almost everyday that I play this game. Oh, well, I was not aware. Chrumps wrote: Oh, well, I was not aware. Thats a very nice thing, town zones with different privileges. Could spare a lot of trouble in town now with salvage and unpaid claims. Now, only thing needed is an active dev to implement it.